The Association for Library Service to Children (ALSC), a division of the American Library Association (ALA), has announced that New Carrollton Public Library is the recipient of the 2017-2018 ALSC/Candlewick Press “Light the Way: Outreach to the Underserved” Grant. As the winner of the grant, the library will receive $3,000 for their Literacy & Library Skills for Refugee Families program. 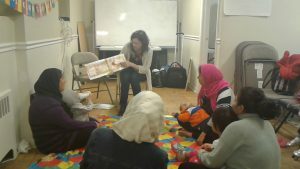 Literacy & Library Skills for Refugee Families started in April 2017. The program was initiated during a time when the library, (located in New Carrollton, MD), was being renovated. With the encouragement of library administration, Program Coordinator, Meisywe Cavanaugh, decided to start visiting a community housing center about five miles from the main library. Cavanaugh found that there was a large population of refugee families and young children living in this area. Currently, families who attend the library program are from: Afghanistan, Syria, Bhutan, Myanmar, Ethiopia and other Arabic speaking countries. Attendees are able to check out library materials, interact with librarians, meet new families and get exposure to the English language. Children enjoy playing with toys, making crafts and interacting with a variety of books. With this grant, New Carrollton Library will now be able to reach their goal of expanding outreach and programming offerings to these families. One part of the expansion will be creating early literacy kits in the native languages of the attendees. 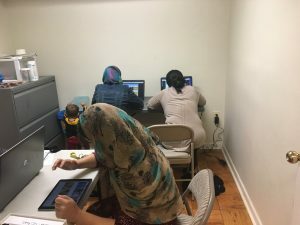 In addition, the library has started to offer an additional day of programming where they offer homework help to refugee children with the assistance of local college students. Despite the positive impact they are making, there are still challenges. The language barriers can make things difficult at times. There are a variety of languages being spoken, including: Dari, Pashto, Nepali, Arabic, and Amharic. Some participants will assist with translating, while other times they must rely on interpreter services to help. Library renovations will be completed this summer. Cavanaugh and her staff will continue to visit the apartment center, but hope that ultimately families will be encouraged to come to the main library, which is accessible via public transportation. The Light the Way Grant, which honors Newbery medalist and Geisel winner Kate DiCamillo, is now in its eighth year. Although originally conceived as a one-time award, it has continued to be presented with the kind generosity of Candlewick Press. Program attendees enjoy weekly storytime. Program participants utilize computer services. Gearing Up for Summer Reading and Summer Learning @ Your Library!